London, UK, July 23, 2018 – Leader Electronics Corporation has chosen IBC 2018 as the launch venue for two powerful additions to its range of broadcast quality test and measurement products: the LV5600 true hybrid IP and SDI waveform monitor and LV7600 rasterising equivalent. 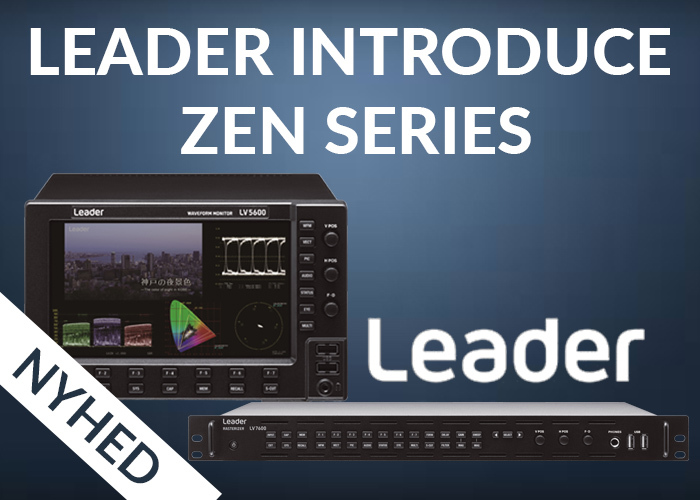 Both form part of Leader's new ZEN series. A broad set of engineering-related features are provided by the LV5600 including test pattern generation, eye pattern display, closed-caption monitoring, CIE colour chart, high dynamic range measurement, focus assist, customisable screen layout, tally interface, 4K/UHD operation, 10G IP input and 12G-SDI interfaces. SMPTE 2022-6, SMPTE 2022-7 and the recently published SMPTE 2110 protocols are all supported. The LV5600 also incorporates Leader's intuitive CINEZONE and CINELITE which are familiar to many content production staff. "Leader has helped many broadcasters and broadcast-equipment manufacturers manage their migration from analog to digital, from standard definition to high definition and from standard dynamic range to high dynamic range," says the company's President, Kozo Nagao. "Most broadcasters now recognise the potential of video over IP both within their studio facilities and for long distance content delivery. The majority will transition to IP via an interim SDI/IP hybrid infrastructure so they will want to handle SDI and IP in a single test and measurement product. The LV5600 and LV7600 address this concern, providing common display interfaces, irrespective of whether the source signal is SDI or IP. Both instruments conform to the Leader style of being intuitive for camera operators to use as well as for engineering staff." The LV5600 true hybrid IP and SDI waveform monitor and LV7600 rasterising equivalent will make their IBC debut on stand 11.B27. Since its establishment 65 years ago, Leader has earned a worldwide reputation for designing and manufacturing highly reliable, practical and cost effective test and measurement instruments. Leader products are specified for research, development, broadcast, production and service applications. Manufacturing quality is built in every step of the way. Less than 0.1% of all Leader products made are ever returned for warranty repair or adjustment.